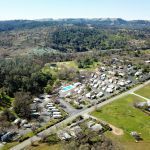 Ask fellow campers about "Gold Strike Village" and nearby attractions. 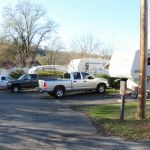 This review is written as a member of a group of 14 rigs staying 3 nights at this RV park. The kitchen and club room facilities are excellent. The "group loop" is exclusive to the group. 50 amp was not available at our site as well as lack of sewer. Satellite coverage is obtainable in some spots. The dump station is near the park entrance and easily accessible. A lot of previous negative comments on this site are either non-existent or corrected. I would recommend this park to any group of 16 or less. We camped at Gold Strike Village in a Motorhome. Condition of the Park ranges from good to bad. Some of the trailers look like they are falling apart and need to be towed away while others are brand new. The bathroom and showers work but the water is luke warm at best and the pressure is terrible. Extremely slippery floors. Roads are in good condition, but with aggressive speed bumps all over the place. They weed whack fairly often so the weeds stay down. Manager and Owner not pleasant or understanding. Made me feel inferior. Park has Loud Bass Booming Music, Loud Cars with Exhaust, Highway right next to it, and kids you don't know who get into your stuff and ask for stuff. Don't go here. We camped at Gold Strike Village in a Travel Trailer. This is a pleasant park. The manager is very friendly and accommodating. Lots of long term residents but lots are kept clean and tidy. Surprised at the trees and shade. Pool is beautiful. Restrooms and showers are extremely clean. Keys are given out to the over nighters. The only complaint is some lots are parked next to three big propane dispensers. Kind of unnerving. We camped at Gold Strike Village in a Fifth Wheel. We have been staying at this park for six years usually for a month long stay. We typically have to trim a few branches to slip into our site with our 40' rig. Park personnel are always helpful and willing to trim as needed to make the site suitable. There is plenty of shade in the upper campground. 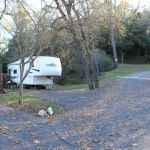 There are also RV sites available in the mobile home section of the park. Those are usually given to longer term stays. We enjoy visiting the gold hills region of California with its mining heritage and newer wine country heritage. We camped at Gold Strike Village in a Motorhome. We stayed here with a Good Sam club. The group site (which holds about 16 rigs) is down behind the pool area. The Wi-Fi worked really well. The power was a little weak and even though we didn't have all 16 spots taken, we blew the breaker that feeds this section. Even without the breaker blown, the power is a little weak. So, you might want to visit here in the fall, winter or spring. The group area is also pretty dry and the only grass is weeds. And in the summer time, they are pretty hard to find, so there isn't much greenery. There are a number of trees. About half of the group sites are shaded. The pool was very clean. The roads were in good shape. The bathrooms and showers are very very clean. There are no sewer hookups in the group sites, so if you are part of a group, go prepared with empty tanks. Also there is no cable or TV reception down in this bowl. The individual sites are very clean and full hookups. There is no convenience store in the area. There is another section of the park where there are permanent residents. Some of their sites are very clean, others not so much. If I was staying in an individual site, I might rated a 8 or 9. Happy camping! We camped at Gold Strike Village in a Fifth Wheel. Our second visit, with a third scheduled. Our only disappointment is that no campfires allowed, however the lower area does have BBQ pits. It is a mix of older, permanent mobile homes and RV's. There is cell phone coverage at the park. We camped at Gold Strike Village in a Travel Trailer. Park is terraced. The upper level sites have electric, water and sewer hoop-ups, the lower level does not have sewer hook-ups. We stayed with a camping group in the lower level and had access to the clubhouse exclusively for our group. It is a full service clubhouse making it ideal for getting together. The swimming pool is a class "A" act and you will enjoy that. Management was very friendly. You will not be able to get TV with your batwing antennae as it is in a valley. A satellite might work if you can locate a clear shot through the many great trees. But really we did not miss TV! We camped at Gold Strike Village in a Motorhome. Are you affiliated with Gold Strike Village ?